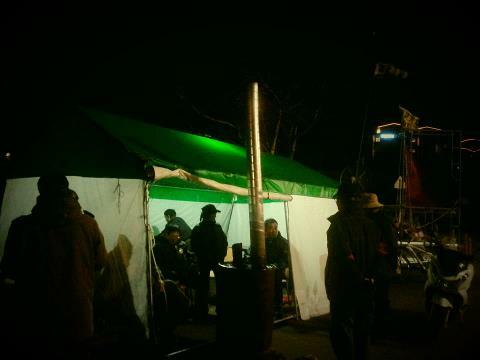 While villagers set up two vigil tents across the construction gates against 24 hour construction (destruction) on Nov. 11. Sunday, the City hall of Seogwipo City is threatening villagers to be volunteering to remove them. If not the City will enforce demolition of them, it bluffs. Currently the facilities set up by the villagers across the gates are: A tent built just across the main gate, a stage vehicle (Both of them have been set up long time ago) and the two recent tents mentioned above. The Seogwipo City decided to demolish tents reasoning that since the tens were set up in the side of road, they are the obstacles for traffic and that there have been complaints by some people who are inferred to be navy-contracted company personnel and pro-base villagers. 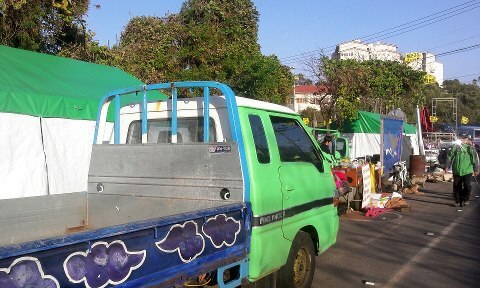 It is known that the Seogwipo City has not decided way and time of demolition: whether it will mobilize a form of ‘administrative execution’ that needs three times notices to people with demand on volunteering removal or ‘emergency removal’ (according to the law on roads) that does not need such notice. The Seogwipo City hall personnel said that if emergency removal is decided, the demolition will be enforced within this week at fast. Jang Sungshim met her 6th fast as of Nov. 12. Photo by Lee Woo-Ki, People’s press conference in Seoul, Nov. 12. For many more photos on the Seoul press conference by Lee Wooki, see here. 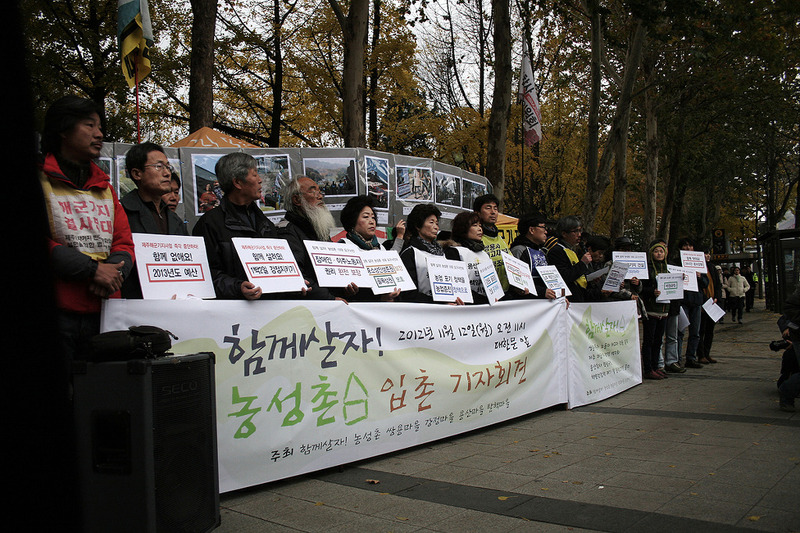 Meanwhile, the people in Seoul held the press conference on opening joint vigil tents’ zone in the center of Seoul in the morning of the same day. The tent zone, succeeding the collective spirit of the Great March for Life and Peace: We are the SKY is hosted by people under the title of ‘Let’s live together! :A vigil zone formed by the unity of the Ssangyong workers, Yongsan families, Gangjeong village and non-nuclear-declared villages.’ See the photos by Lee Woo-Ki here. Otherwise, the Chosun Ilbo, the most conservative right wing media in South Korea, had a criticizing article on the Seoul vigil tent zone on the top of its 1st page that it is illegal. 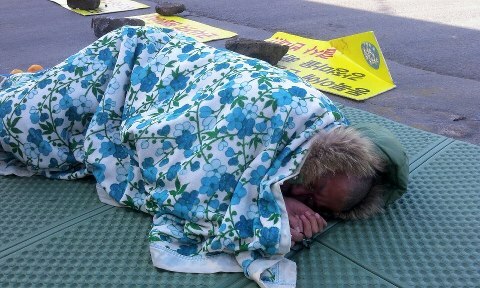 The article also criticized that Park Won-Soon, mayor of Seoul has no intervention on it and supports tent zones. A Newsis photo shown in the article in the top of the most conservative right wing Chosun Ilbo website, Nov. 13, 2012. The media reports that the National Defense committee of the National Assembly could not conclude on the talk on the 200 billion won of the 2013 Jeju naval base project budget on Nov. 12, Monday. The National Defense committee of the ROK National Assembly has planned to have the 2nd meeting (following the 1st meeting on Nov. 8) by its Budget and Balance sub-committee on the Jeju naval base project budget 2013 (earmarked by the Defense Acquision Program Administration) in the morning of Nov. 12. However, because of wide gap between the ruling and opposition parties, the sub-committee could not be held on the day. 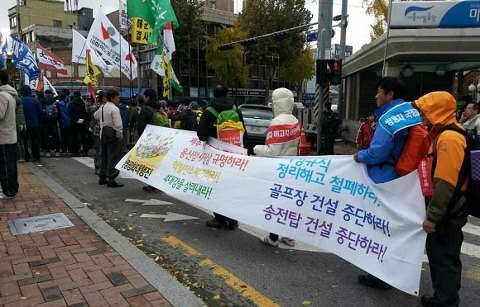 While the Democratic United Party demands the ‘whole cut’ of budget, claiming that the Jeju naval base project construction is being enforced in inappropriate way, the ruling Saenuri Party (New Frontier Party) confronts it, demanding ‘part cut’ and saying the project should be driven as planned. The National Defense Committee has a plan to re-open the Budget and Balance sub-committee in the morning of Nov. 16 through agreement and tuning between the coordinators of the parties. Citing an article of Chosun Ilbo on Nov. 14, the Jeju Sori on Nov. 14 reports that the Democratic United Party is withdrawing from its official position of ‘whole cut’ on the 2013 Jeju naval base budget. It is considering ‘conditional pass,’ of about 200 billion won budget for 2013 naval base project. Its reasoning is told that because ‘it is afraid of bad influence to the Presidential election in December, if it cuts the 2013 budget on the project.’ [..]How you can help to CUT THE BUDGET? Please see the link. 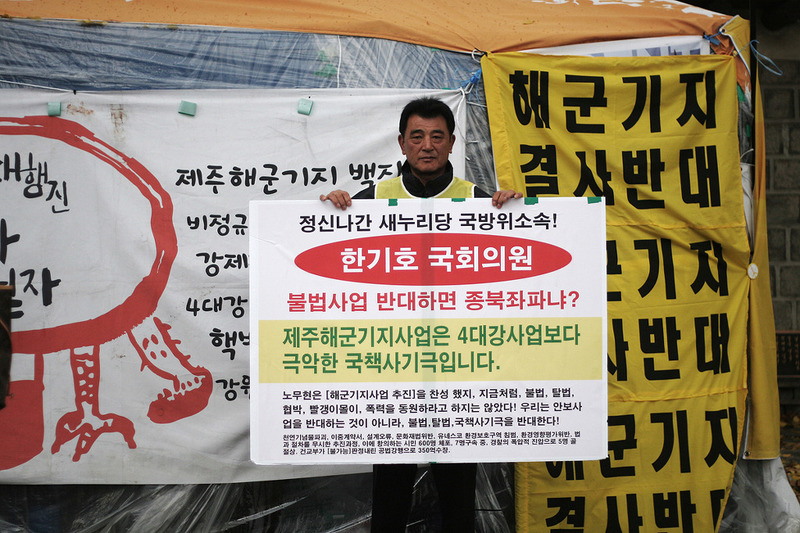 Photo by Lee Wooki/ Village mayor Kang Dong-Kyun holds a sign that denounces Han Ki-Ho, a member of National Defense committee of the National Assembly and ruling Saenuri Party(New Frontier Party)who condemns the anti-base people as if they are pro North Korea. Dungree made a satire video on Han Ki-Ho. Watch it here.